Sheppard Pratt’s neuropsychiatry services for people with autism and developmental disabilities help people ages 18 and older live full, productive lives. We offer exceptional expertise in evaluating and treating problems affecting thinking, behavior, and emotions. And our coordination services help maximize your loved one’s independence. Detailed evaluations: Your loved one receives a complete evaluation where we explore the many possible causes of their symptoms. Assessments often include mental status and neurologic exams. Find out more about neuropsychiatric evaluations. Highly skilled team: Our team includes social workers who specialize in developmental disabilities and a psychotherapist specializing in autism. We tailor therapies to meet your loved one’s evolving needs and keep their care moving forward. Find out more about neuropsychiatric treatments. Research: We are finding new ways to support our patients through research. Our interests include improving transitions from pediatric to adult care in people with autism. We are also exploring neuropsychiatric issues in people with intellectual disabilities. Personalized treatment plan: Our complete care approach includes a combination of treatments and services to help your loved one live his or her best life. This plan may include brain stimulation procedures or inpatient care if your loved one is in crisis. 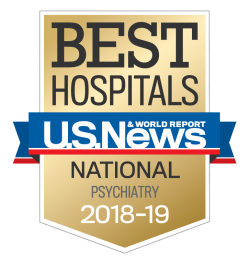 Find out more about neuropsychiatric treatments.